You might already be aware of the fact that there are media players available for Android that can zoom videos while playing them. The zoom feature is especially useful for catching details in HD videos on small screen devices like the iPhone or iPad. Though iOS 7 introduced pinch-zooming while recording videos, you can’t usually zoom in or out of videos while playing them. Apple recently announced iOS 9 at WWDC15, but there are many subtle features introduced in the new version that Apple didn’t talk about. One such feature is pinch to zoom in video playback. In iOS 9, whenever you play videos from Camera Roll, the native player lets you zoom the video while playing them. You’ll be able to try out this new feature as soon as you upgrade to iOS 9. If you have not upgraded to iOS 9, or looking for some alternative third party apps that support zooming during video playback, you may try these apps mentioned below. Zoom Zoom Player is a simple video player app for iOS that can play all video formats supported on iPhone, iPad and iPod Touch. The player is able to play any video from your camera roll album or from its local storage. To play a particular video, select it from the Photos Library or In-App Library and it will start playback on a different screen. While playing a video, you can double tap on any part of the video to zoom in and scroll around the entire video frame in zoom mode. In zoomed mode, double tapping on the video brings you back to 1X zoom. Alternatively, there is also a seek bar at the bottom to manually adjust the zoom setting. The app supports playback in both portrait and landscape orientation. Zoom Zoom Player is available in Lite and Pro Versions. The Lite Version is free to download and supports up to 2X zoom, while the Pro Version supports up to 4X zoom and may be purchased from the App Store for $1.99. Zoom Zoom Player allows you to play videos in zoomed mode. But what if you needed to zoom into a particular video while recording, but forgot to do so. That’s where Video Zoom comes to the rescue. 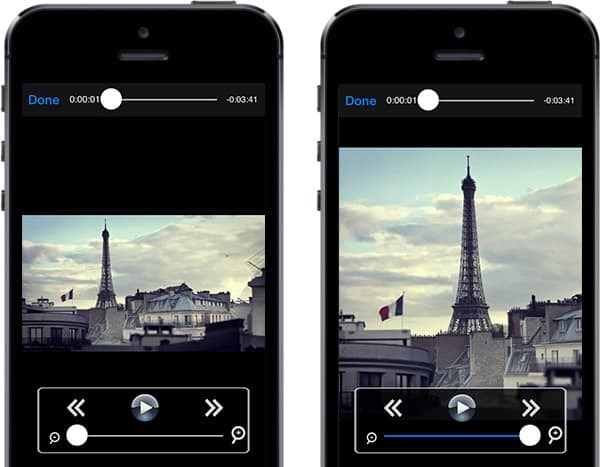 Video Zoom is a video player and editor with zoom support. The first time you launch the app, it will scan your photo albums for stored videos and display them as thumbnails in its own library. You can then tap on a particular video thumbnail to preview it on top of the screen or tap the thumbnail again to open it in a separate editor window. Here, you can zoom in and out of the video while playing it and scroll through the entire frame of the video in zoomed mode. As you zoom in, zoom out or move round the video while playing it, a graph at the bottom will record your actions against the timeline. 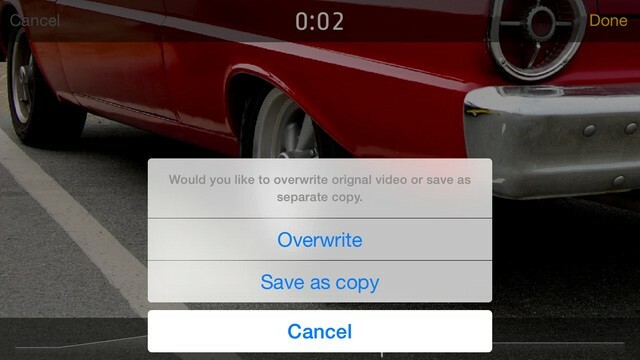 After playing the video, if you tap on Done in the top right corner of the screen, the app will ask you whether you want to overwrite the existing video or save a different copy. The saved video will include the zoom in, zoom out and scroll operations as you had performed them while playing the video in the editor. Get Video Zoom from the App Store. If you know of any other iOS apps that support zooming of videos while playback, tell us about it in the comments below. Subscribe to our newsletter to know more features and tricks for your smartphone, computer or anything tech-related.